Welcome to a Taste of Being Miraculous! Would you like a taste of how miraculous you actually are? Are you ready to have that much fun? What is a Taste of Being Miraculous? We have a capacity for miracles that is unfounded and greater than anything we’ve ever acknowledged. We have the capacity to be a miracle walking, a miracle talking, and a miracle creating that will actually change the world. WHAT IS A TASTE OF BEING? 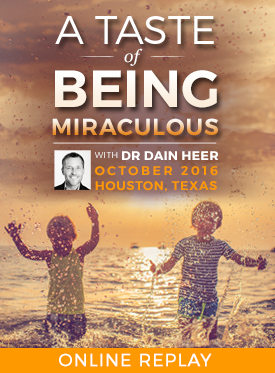 In this evening class, you will get to explore what is possible in Dr. Dain Heer´s three signature classes, The Being You Changing the World Event, the Energetic Synthesis of Being Class and the Symphony of Possibilities Training. During these hours, you will get access to real, pragmatic and dynamic tools, and the energetic awareness to create the life you’d truly like to have and the world you would truly like to live in! What if YOU are far greater than you’ve ever given yourself credit for? What if we, together, have the capacity to BE what creates the future we know is possible? Upon ordering the English version, a delivery email with download instructions will be sent to you so that you may download your files. If you log in prior to purchase you will also be able to access your downloads from your account dashboard under digital downloads.